It’s nearly impossible today to go anywhere without seeing someone talking into a tiny earpiece, but the headsets with blinking blue lights were not so common just a decade ago. Use of Bluetooth-equipped devices has stretched across the globe, yet the technology’s origins and name can be traced to an engineer obsessed with making computers function using as little energy as possible. “Power is one of the key attributes. Battery life is life. It’s the life of the product. To ignore that is totally unacceptable. You have to design things to work efficiently, but more importantly, do nothing efficiently,” said Jim Kardach, retired chief power architect at Intel. Originally intended as a wireless replacement for cables to connect phones, headsets, computers, keyboards and mice, Bluetooth technology has proliferated over the past decade, allowing devices in close proximity to connect while using very little battery power. The headsets are ubiquitous, but according to the Bluetooth Special Interest Group (SIG) they are only one of many product types that make up the 9 billion Bluetooth devices in the world today. That number keeps growing. Over the next 2 years, annual Bluetooth device shipments are expected to double from 2 to 4 billion, according to ABI Research. 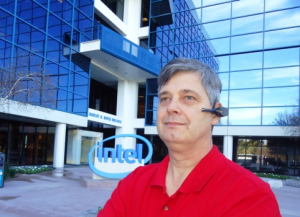 Intel mobile computing engineer Jim Kardach was instrumental in bringing together Ericsson, IBM, Intel, Nokia and Toshiba to form the Bluetooth SIG in 1998. That group created the universal standard that is used by more than 17,000 member companies. Kardach recalls playing the role of instigator and mediator among the founding companies, but says the group quickly agreed on a common goal to create a small, low-power consuming, low-cost, short-range radio with built-in security and the ability to connect ad hoc with other devices. Inspired by a book about Vikings that he was reading at the time, he came up with the Bluetooth name. Just days before he retired in December, Kardach reflected on his 27-year career at Intel, including the genesis of Bluetooth, the many low-power design breakthroughs that led to 100 patents and his work on the first notebook system-on-chip (SoC) sold in the 1980s by Intel called the 386SL/486SL. How did you get involved with the creation of Bluetooth? We got together Ericsson, Nokia, Toshiba and IBM. That probably represented 60 percent of both the cellphone and notebook markets at the time. The key was to define the goals of what we wanted to do. We formed a SIG, all agreeing that we wanted to build this universal, very low-cost, private, wireless cable. We did it under an open IP (intellectual property) policy, allowing us to take the best pieces from everywhere and put them together. We had goals on what we wanted this thing to cost and strategies for it being built on a bulk CMOS process, which hadn’t been done before. It had security, privacy and had to work across the world, so we picked the ISM band, which required fixing some of the regulatory issues around it. We had a term sheet that everyone agreed to and we put it together. Intel became the leader simply because we had IBM and Toshiba who didn’t trust each other, and Ericsson and Nokia who didn’t trust each other, so we were kind of the Switzerland. How does a chief power architect look at things? The idea for the Bluetooth name came from Jim Kardach of Intel, who was reading a historical novel about Vikings and King Harald Bluetooth at the time. Power is one of the key attributes. Battery life is life. It’s the life of the product. To ignore that is totally unacceptable. You have to design things to work efficiently, but more importantly, do nothing efficiently. Those are the two rules of power management. We rely on architectural designs to lower power use. We design chips to turn things off and back on only when they’re needed. We architect things to minimize latency and anticipate when something is needed so it gets turned on just in time. We used to rely on randomness, like when you drive to work and hope to miss all of the red lights, but more recently we’ve purposely tried to line up activities in order to create big idle gaps between these activities. If the idle gaps are long enough, we can shut off all of the power. For example, we now have special offloading accelerators that run to do specialized media loads and then be able to put the rest of the platform to a low-power state, which means 98 percent of it is powered off. Hardware not designed for power management can be like crying babies that wake up the whole house. They ping memory every couple of milliseconds or microseconds, keeping the CPU out of its low-power state. This can keep memory and the busses between them alive. A Bluetooth radio should require about a milliwatt of power, but when you put it on a USB plug, because of the way the bus was architected, it generates an extra 6 watts of power by pinging memory every millisecond. These are things we want to catch up front when architecting for good power management. The fourth-generation Intel Core processors that use an SoC design are coming out soon. What’s the advantage of SoCs over traditional CPU designs? SoC allows you to do things that aren’t possible if you have a handful of chips from different venders. We have the advantage of doing our own chipsets and CPUs, which allows us to design power management between them and the rest of the platform. In the 1980s I worked on the 3SL and 4SL SoCs. We were doing it in an era where we were cramming hundreds of thousands of transistors on a die and now we can fit billions. We can now take advantage of Moore’s Law and increased capacity that we’re getting from bigger wafers and smaller transistors. This lets us integrate more capabilities into a small chip. Having an SoC allows us to bring power management across the platform. With the 3SL, we added new operating modes to the CPU that pulled some power management underneath the operating system. This work is still used today. To design an SoC, sometimes you have to trade off time to market but you can really take advantage of them to manage power consumption. This content was originally published on the Intel Free Press website.